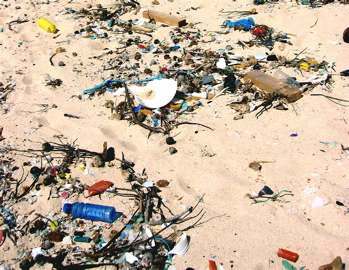 Take a walk along any beach in Barbados or anywhere in the world for that matter – and you’ll see the plastic rubbish washed up on the shore. Nets, flip-flops, water bottles, toys, bags, lines and so many fishing net floats. Ask any mariner though, and you’ll be told that what we see on the shore is nothing compared with what’s out there in the sea. Ask any marine diesel mechanic about the increasing number of engines ruined by plastic blockages in the cooling system. Ask any marine biologist about the fish and bird kill by plastic. According to the National Oceanic and Atmospheric Administration (NOAA) of the United States, there is a garbage patch made of floating plastic in the Pacific Ocean that covers an area twice the size of Texas. It’s called the Great Pacific Garbage Patch. We can’t continue like this folks, around the world or on this island. Just look around Barbados at the plastic rubbish everywhere. It doesn’t matter where you go – to the remotest cove, gully or field – you’ll find this plastic garbage and much of it is plastic water and beverage bottles. Filling your own bottle from the tap is one thing, tossing endless empty plastic bottles into landfills and the ocean is another. Whatsay, friends? Could we, should we, restrict or ban the sale of disposable plastic water bottles in Barbados? For the next little while you’ll notice our “Please visit our friends at…” banner at the top of the website. We’ll be rotating a different banner in this spot each day. Sometimes we’ll feature a website or blog we like, and sometimes we’ll feature a local business. Just click on the banner and you’ll be taken to the featured website in a newly opened page on your browser. None of the websites we feature are paying us or are under any obligation to feature a link to Barbados Free Press. We know from past experience that a single link or photo can send many hundreds of our readers a day to another website and we’d like to help out where we can. And… if we’ve featured your website in our banner rotation and you’d rather we didn’t, that’s alright too. Just let us know. No offense will be taken because we know how difficult it can sometimes be to do business and manage the politics on this little rock.